We’d love your help. Let us know what’s wrong with this preview of The Summer I Learned to Fly by Dana Reinhardt. Drew's a bit of a loner. She has a pet rat, her dead dad's Book of Lists, an encyclopedic knowledge of cheese from working at her mom's cheese shop, and a crush on Nick, the surf bum who works behind the counter. It's the summer before eighth grade and Drew's days seem like business as usual, until one night after closing time, when she meets a strange boy in the alley nam Drew's a bit of a loner. She has a pet rat, her dead dad's Book of Lists, an encyclopedic knowledge of cheese from working at her mom's cheese shop, and a crush on Nick, the surf bum who works behind the counter. It's the summer before eighth grade and Drew's days seem like business as usual, until one night after closing time, when she meets a strange boy in the alley named Emmett Crane. Who he is, why he's there, where the cut on his cheek came from, and his bottomless knowledge of rats are all mysteries Drew will untangle as they are drawn closer together, and Drew enters into the first true friendship, and adventure, of her life. To ask other readers questions about The Summer I Learned to Fly, please sign up. Iris McTarsney The characters in the book are around age 13, and the content of the book is suited well for that range of early-teen years and above. Who would you reccomend this book to? Irene Sim Everyone who likes a well written book. I'm fourty years old and I enjoyed it very much though I generally avoid books with so young characters. I was not boy crazy. Really, I wasn't. But I was lonely, I guess. Yuuuuuup. Definitely too old for this mess. It just felt so incredibly...preteen-end-all-be-all love. That's not to say that I didn't enjoy this one but every major decision our main character (Drew) made just made me want to roll my eyes. Maybe it's because I'm more than a decade out of this but she seemed just so oblivious to everything that really mattered. Case-and-point: Oh? There's a boy hanging around waiting for me to drop off the leftover cheese every day from the cheese shop? Huh. Weird. (absolutely no thoughts to his obvious homelessness and hunger). Let me drop everything, get on a bus with the homeless boy and abandon my pet rat in some big poetical goodbye worth of Anne of Green Gables. (ABSOLUTELY NO THOUGHTS about how she hid that rat in her backpack for nearly a year and no one noticed. Oh no. Let me just abandon the poor tame thing to starve in the wild. Other than that, I did enjoy this one (mostly). Extremely well-read. Very realistic tone and inflection. I always enjoy Dana Reinhardt's work. She does YA really well without an overdose of angst. She captures emotions poignantly without wordiness. This wasn't a story I particularly connected with, but it was solidly ok for the genre. The audiobook was also a 3-4 star performance. It is a beautiful story and I loved every word of it. Drew (also known as Robin or sometimes Birdie) is a thirteen year old girl. I usually avoid reading books with characters so young because I find them too immature, too obsessive in their little universe for my taste and probably I would skip this book if I’d known it beforehand. But I’m so glad I didn’t. ”He was an ordinary rat. He didn’t talk. He didn’t have magical powers, a lesson to teach me, or wisdom to impart. He was just a rat, and although at first he made me squeamish, I grew to love him terribly. From sentences like these the author gets you to expect things to happen in the story, she builds atmosphere and anticipation. The way we perceive the facts through her senses makes us participants to the story. Young people can be very observant of little things that we grown ups might consider nonessential. But these little things that we let slip our guard may be the cause of unnecessary angst or pain to children just because they lack maturity to deal with it. I used to be that girl. Tame, always willing to obey orders, never giving troubles to my parents. Even when I became an adult. But my life changed drastically for the better once I discovered the power of the word “No”. Parents often disguise their peace of mind as “I know what’s best for you” when in truth it’s just what suits them better. And then came Emmett Crane. A boy, who shared freely his knowledge about rats, but kept secrets about himself. A boy, who made Drew to want more for herself and step out of her comfort zone. He took her hand and lead her to a journey trying to achieve a miracle. It was a brilliant coming-of-age story. It expresses uniquely the uncertainty of childhood, the puerility you anticipate to overcome but fear of losing. In the category: "A book with a kid or teenager protagonist"
It's weird how I feel when I think about this book and now I'm coming to understand that Dana Reinhardt is not a predictable author. She is versatile in the best possible way. I like an author who can genuinely make me feel different for whatever reason. In this particular story we witness one summer of a thirteen-year-old girl named Drew (formerly known as Robin Drew, and sometimes Birdie). She and her mother are attempting to start a new life now that they have lost Drew's dad. Her mother has o It's weird how I feel when I think about this book and now I'm coming to understand that Dana Reinhardt is not a predictable author. She is versatile in the best possible way. I like an author who can genuinely make me feel different for whatever reason. In this particular story we witness one summer of a thirteen-year-old girl named Drew (formerly known as Robin Drew, and sometimes Birdie). She and her mother are attempting to start a new life now that they have lost Drew's dad. Her mother has opened up a cheese shop and Drew spends her days helping out at the shop and fawning over the heart of gold surfer, Nick, who works there too. (Side note: I LOVED this character.) She also owns a pet rat named Hum. Drew thinks her summer will be uneventful, but then she meets a boy. Not a typical boy either. He knows about rats, how to make paper cranes, and really is unlike anybody she has ever meet. The thing is, Drew can tell he's hiding something but he doesn't want to reveal what it is. She'll find out what his secret is and what follows is a summer she won't ever forget. To appreciate this story you have to be willing to be patient and like coming of age stories. Drew and Emmett are both offbeat characters, but it works because they get and learn to understand each other. It also doesn't follow the conventional path of characters falling for each other, and events 1, 2, and 3 happening in this order. Where I felt like the book was lacking was the plot. The plot is fine but it would have been much stronger if there were more events following up to the climax. Reinhardt is not an overly popular author, but that is one of the reasons why I like her because she isn't writing a story to make a profit off a trend. She seems to actually write stories she feels are important to tell, and I can admire and get behind that. Reviewed for the "Reviews from Depth of Time" Marathon. If someone asked me what this book was about, I wouldn't really know how to answer, only that it was amazing. I guess I could start out by saying it's about a girl who works at her mother's cheese shop, who meets a boy, and the rat that brought them together. From the very first paragraph of the book, I immediately loved it. For some people it's the smell of sunblock. Or pine trees. A burnt marshmellow from the embers of a fire. Maybe your Reviewed for the "Reviews from Depth of Time" Marathon. For some people it's the smell of sunblock. Or pine trees. A burnt marshmellow from the embers of a fire. Maybe your grandfather's aftershave. Everyone has that smell. The particular scent that transports you, even if for an instant, to the long-ago, faraway land of your childhood. For me, it's the smell of Limburger. Or Camembert. Sometimes Stilton. Take your pick from the stinkiest of cheeses. Drew works at her mother's cheese shop. Her pet rat goes missing, and suddenly turns up in the hands of a stranger. A stranger picking scraps from the alley behind their shop. Emmett. A mysterious boy with a vast knowledge of rats. And Drew wants to find out more about him. Together, they take a journey that lasts a lifetime. *Sigh* I got this while I was on vacation in Duck, North Carolina, last summer. This little bookshop hidden in a beautiful outside shopping mall. I bought a book inside the shop, and the lady at the front said I could pick a free book from a bookcase containing ARCS and Uncorrected Proof books. On a whim, I picked the summer i learned to fly by Dana Reinhardt. Why? That year, even though the judges were horrible, I was greatly immersed in American Idol, because my favorite singer was Haley Reinhart. That's how I noticed the book. Reinhart, Reinhardt. Anyway, it turned out to be one of the best things I did, because I loved this book. It was bittersweet, I had to force myself to read it slowly, otherwise I'd finish it before the beach week was even over. It was an advanced reader's copy, to be released July 12th, when I read it in May. Back then, I hadn't heard of Goodreads (I'm not sure how I survived), so I didn't write a review of it so people could see how amazing it is. A cross between Jerry Spinelli & Sarah Dessen; The Summer I Learned to Fly, was a sweet, endearing, and bittersweet coming-of-age story. Drew – Robin – Birdie – she’s 13 and a half years old, almost 14. And in the 13 years she’s been alive, she’s only had 6 people she could consider “friends.” But, they don’t appreciate her quirky sense of humor, and they’re disgusted with her pet rat, Hum, whom she takes with her everywhere. Her dad died when she young, but he’d left her a list, a piece of him for her to keep for always. Then, there’s the gorgeous, perfect, older, surfer boy Nick, who works at her mother’s Cheese shop. But, it seems her mother’s got her hands full this summer, because all signs lead to her dating someone in a silver Honda, or Toyota. Or at least, that’s what the boy behind the dumpsters (with a cut on his face), and Hum on his shoulder, says. An old legend. Two runaways. Friendship. Hope. Miracles. Growing up. Life. There were no fancy twists, or hormone induced romance with sizzling chemistry, resulting in typical teenager-y. There were only moments of understanding and realization and heartbreak and beauty. And, by the end of it, I couldn’t help but feel incredibly sad; hopeful, but definitely sad. I loved it. "Can you hear me, Emmett Crane? You were my first real friend, the first person I really knew, who knew me too, so it doesn't surprise me that I want to say to you the very same things you said to me. Because of you, things are better." "When you start reading a Dana Reinhardt book, it's like discovering a new friend. Okay, I'll admit, the book was kind of a drag in the beginning. By the time you've turned the final page, it's like saying goodbye to your best friend, and I can think of nothing better to ask of a writer." The introduction was kind of long. I don't mind if the catalyst comes late in the book, but there at least needs to be some action in the introduction, where they're actually doing things. However, the setting was pretty unique and the main character was fun to read about, so I didn't really mind. "At school, with my classmates and friends, I had to decode the hidden meaning of words, to search for what Ms. Bethel in our English class called intentionality. There was what people said, and then there was what they were thinking. Take that first lunch at Antonio's when Georgia said Shut up, when what she really meant was Say more. One thing I knew for sure was that boys never came out and told girls they liked them, and girls certainly never told this to boys. 'Good,' he said. 'I'm glad we go "At school, with my classmates and friends, I had to decode the hidden meaning of words, to search for what Ms. Bethel in our English class called intentionality. There was what people said, and then there was what they were thinking. Take that first lunch at Antonio's when Georgia said Shut up, when what she really meant was Say more. I drained the pasta and grated the cheese over it. I slid the plate in front of him. For some reason I felt totally at ease. Even my sheep pajamas seemed less a crime against humanity. 'So will you blow off work and spend the day with me tomorrow?" 'All right!' He put his hand up for a high five and then caught my hand midslap and squeezed it tight. It was friendly. It lasted only a second. And it was the single most romantic moment of my life." It's gotten to the point where I will put off pretty much everything for a new Dana Reinhardt novel. She never disappoints, and this title is no exception. Drew Robin Solo is a young girl caught just on the threshold of growing up. She lives with her mother, and spends most of her time helping in her mom's newly-opened gourmet cheese shop. There, she crushes on her older co-worker, Nick, cares for a pet rat named Hum, and meets a mysterious boy, Emmett Crane, one night in the alley behind the store. Drew has never imagined her life to be anything close to exciting, so she's drawn to Emmett by his stories, his kindness, and the need to know more about him. As Drew learns Emmett's background, and his reasons for being in town that summer, she learns the true meanings of sacrifice, family, and friendship. A contemporary coming-of-age story which I decided to check out for Lyn. “The Summer I Learned to Fly” is simply and artfully written, with an interesting look at the growing pains and hidden joys of navigating teenage life and coping with changes that come along unexpectedly. Thirteen-year-old Drew comes to terms with the loss of her father and helps out in her mother’s new cheese shop. Like most teenagers, she feels what it’s like to have her first serious crush, inevitable clashes with parent A contemporary coming-of-age story which I decided to check out for Lyn. “The Summer I Learned to Fly” is simply and artfully written, with an interesting look at the growing pains and hidden joys of navigating teenage life and coping with changes that come along unexpectedly. Thirteen-year-old Drew comes to terms with the loss of her father and helps out in her mother’s new cheese shop. Like most teenagers, she feels what it’s like to have her first serious crush, inevitable clashes with parental authority and unavoidable teenage angst and doubts. The highlight of her long school break is a new friendship with Emmett Crane, a boy which appears out of nowhere, and while she tries to figure him out and help him in his quest, ends up exploring new life experiences and finding peace within herself. Stories with simple plots are usually the most difficult to pen, because the content has to reach out to the reader without the employment of action, suspense, twists and turns and whatever you find in such exciting novels. I’ve read some of such books that fell flat, and I’m glad this book worked. Reinhardt gives an honest and realistic look at a young teen’s psyche and makes it fun, touching and for me, nostalgic. The ending was not exactly what I wished for, but it was strangely satisfying. Highly recommended to all my goodreads friends 10 years old and above. It's nice story and nice reading, but it's not 5 stars book. Story is about little girl growing up in little town. It's story about meeting and understanding people, finding friends. Descriptions in this book are really nice, and connections between characters are also very well written. But overall the thing I like the most in this book is the ending. You'll enjoy reading this book, it's small and nice book. The Summer I Learned To Fly by Dana Reinhardt is a short and sweet coming-of-age story about a young girl in a small town - a girl that we can probably all relate to at least a little bit. **Nick Drummond - 19-year-old Nick works in the family Cheese Shop, and he's Drew's crush. He's so dreamy and he's nice to Drew and he rides a Vespa. **Lord High Rat Humboldt Fog, Drew's pet rat, aka "Hum" - yes, Drew has a pet rat, which is kind of gross, but for she really does love the thing. **The Book of Lists. This was actually the most heart-breaking/heart-warming part of the whole book, probably. Drew's father kept a book of random lists and she found it in the closet one day when she was looking for a shawl or a scarf or something to wear. Since these lists were written by her father, they become super-special to her, and she reads them over and over and over. This book of lists is something that she needs to learn more about her father and to be closer to him. I loved it. **Aunt Swoozie. She's from Wisconsin, but ends up close-by. Ends up coming to the shop most days. Drew can ask Aunt Swoozie things she can't ask her mom, so they're very close. They talk about important stuff, like about stuff from her father's lists (Drew's mom doesn't know that Drew has the Book of Lists). Drew has friends, but she prefers the company of Nick and Aunt Swoozie to anyone else in her life. As summer approaches, Drew's mom suggests that Drew stop working and just rest a little - Drew is offended! She wants to work and she wants to get paid for it! Mom explains that there isn't quite enough money coming in and that Drew needs to cut her hours, which makes Drew sad and a little angry. To top it off, Nick gets a girlfriend. One day, Drew leaves early and arrives home only to find that she's left Hum at the shop (yes, she takes the rat to the Cheese Shop with her - gross). She goes back and hears whispering behind the dumpster. The whispers belong to the one and only Emmett Crane who is talking to Hum, who he has befriended. Drew and Emmett talk for a few minutes and end up kind-of hitting it off. What follows? Meetings in the park with blankets and cheese. Great conversations and questions that are evaded. Time spent at Drew's house hanging out. Their friendship builds and a (ssshhh) a crush forms, separate from the crush on Nick (which doesn't matter anymore because he has an actual real, live girlfriend). Over time, the friendship continues to grow but Emmett is always hard to locate and sometimes there are days between visits. It seems that he is always the one contacting her, finding her, leaving messages for her. He is never available when she wants to talk to him. This frustrates Drew, but she doesn't really know what she can do about it. In the meantime, Nick has a really bad accident on his Vespa, which devastates Drew - remember, she's crushed on him for a long time and considers him a friend. It's at this point that her summer seems to take a bit of a turn: Emmett seems aloof and Nick is no longer working at the shop. Everything is different and Drew can't depend on things to be as they always have. In talking with Nick and in learning to trust Emmett, Drew learns a few things about herself and sort of grows up a bit in the process. 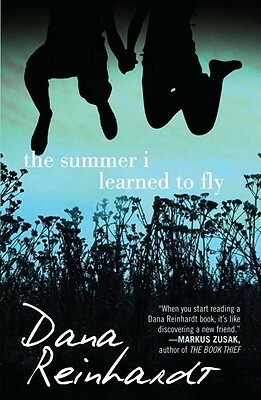 The Summer I Learned To Fly by Dana Reinhardt is super short story that is a great coming-of-age, feel-good read. It is one of those books you spend a little time reading, you close the book, and you probably just hug it for a second before you put it down and move on to the next thing. Drew is such a relatable character going thru such a relatable time in her life, and I think that is what makes the story so endearing. I loved Drew's connection with her father through his Book of Lists - he isn't present in the story in person, but he is sort-of present by way of his lists. Drew finds comfort in learning about who he is and how she is like him by reading his words, and I think that is so very much how a young person would be in real life. I think I would be that way if I in the same situation that Drew finds herself in. I love that Drew has her Aunt Swoozie to confide in and to love on. I love that she had her friend Nick at the Cheese Shop - even though Nick was a little older, he realized the importance of his place in her life and he embraced it. He never made fun of Drew - rather, he built her up, he encouraged her, he took on a "big brother" role, which is such a great thing for a person of his age. When he finally finds a girlfriend, he (and the girlfriend) break it to Drew gently and allow her to acclimate to this disruption in her life and eventually she accepts this as the norm. I love everything about his character. And Emmett Crane - such a great character! He was such a mystery for the majority of the book, but he had to be for the story to work. Drew wasn't entirely sure about what Emmett was up to, and neither was I as the reader. In the end, though, it worked out for all of us, and the story turned out really well. Perhaps one of the more interesting relationships in the book was the relationship between Drew and her mother, because it was evolving. Drew finds herself at a place in life when she needs her mother the most, and yet her mother is around the least. Her mother doesn't mean any harm in what she's doing, it's just that she is at a turning point in her life and Drew is having a difficult time dealing with this. This part of the story is part of what makes the coming-of-age part of the story so well-written and so wonderfully done and relatable. I recommend The Summer I Learned To Fly by Dana Reinhardt for YA readers of all ages, readers that enjoy coming-of-age stories, and readers that enjoy stories set in small towns. I think that the book is perfect for younger YA readers and also perfect for reluctant readers (particularly females) as well. This was a beautiful book and I really enjoyed reading it...I even cried a bit! I don't know what made me want to read this book. I had read other books by Dana Reinhardt and they were not exactly my favorite books. But this one is the best from her so far. DREW, who is working at her mother's cheese shop, doesn't really know what to do with herself besides listen to what her mother says, take care of her pet rat, and crush on nick who also works for her mother. But then she meets EMMETT, and that's when Drew and I fall in love. Her reaction to him and their friendship was I don't know what made me want to read this book. I had read other books by Dana Reinhardt and they were not exactly my favorite books. But this one is the best from her so far. DREW, who is working at her mother's cheese shop, doesn't really know what to do with herself besides listen to what her mother says, take care of her pet rat, and crush on nick who also works for her mother. But then she meets EMMETT, and that's when Drew and I fall in love. Her reaction to him and their friendship was so strong and yet naive at the same time. In taking a chance on something she doesn't quite understand, she grows from a child to a teenager. I loved reading her growth and thought it was realistic and familiar. EMMETT is such a great love interest and catalyst for Drew's story. I love when we really find out about Emmett and his life. It made him even more lovable instead of melodramatic which he could have easily been compared to. And the ending when (view spoiler)[ he sends that last note in the paper crane after all those years (hide spoiler)] made me love him even more. I enjoyed that the chapters weren't numbered but had their own little title. It solidified Drew's story and made me anticipate what was going to happen next. All of the characters for me were real and had substance. Nothing in this story was a page filler as background characters tend to be. I'd gladly read this book again for a good cry. Nothing like a good cry first thing in the morning. Gah. Work at mom's cheese shop. Check. Continue to ogle and sigh over Nick. Check. Everything was at it was supposed to be...until Emmett Crane came into her life. I'm not a big MG reader; I always think that I won't be able to relate with the characters because I'm old enough to be their mother. This book took me by surprise. It was refreshing to read something that did not involve much of the teenage a Nothing like a good cry first thing in the morning. Gah. I'm not a big MG reader; I always think that I won't be able to relate with the characters because I'm old enough to be their mother. This book took me by surprise. It was refreshing to read something that did not involve much of the teenage angst that I've been reading lately. Trust me, this book still made me choke up but I think it had something to do with Emmett's belief of a myth which would provide his family the miracle that they needed. This story was endearing, sad and hopeful. It dealt with a teenage girl's way of learning about a father who was gone too soon and a teenage boy's quest to help a sick younger brother. Diana Reinhardt wrote some incredibly real characters with genuine voices. However, I found Emmett's quest to be unrealistic and in the end, anti-climactic. Perhaps Ms. Reinhardt captured the innocence of youth too well; to have heard of the myth so many times that he actually believed it. I'm probably not the intended target audience, as this was a true coming of age story of a thirteen year old in the summer of changes. I'm not too fond of Reinhardt, actually, but The Summer I Learned to Fly was a bit different. The characters were quirky and humorous, albeit somewhat one-dimensional (the mother, Nick, even Emmett Crane at times), the setting was refreshing, and the story line a bit strange, falling in the fantasy genre. I did like this, until towards the second half, where thin I'm probably not the intended target audience, as this was a true coming of age story of a thirteen year old in the summer of changes. I'm not too fond of Reinhardt, actually, but The Summer I Learned to Fly was a bit different. The characters were quirky and humorous, albeit somewhat one-dimensional (the mother, Nick, even Emmett Crane at times), the setting was refreshing, and the story line a bit strange, falling in the fantasy genre. I did like this, until towards the second half, where things aren't as they seem and a boy and a girl pretty much look for an elixir. No seriously, that's what it felt like. They were looking for a miracle, and somehow, they found it, not because it actually existed but because of the experience. Sounds rather forced and intrusive to the general plot I'd been liking so far, so I definitely didn't enjoy it towards the far-fetched end. I'm just wondering how many young adults have a mother and father who are both still living and are still married to one another. The Summer I Learned to Fly is another YA book where the main character's father died and another character's father ran out on the family. I really enjoyed the book, though. It's the second book I've read recently that included a Book of Lists--this one in a composition notebook whose cover looked like TV static. Drew's father had written down lists of some of his fav I'm just wondering how many young adults have a mother and father who are both still living and are still married to one another. The Summer I Learned to Fly is another YA book where the main character's father died and another character's father ran out on the family. I really enjoyed the book, though. It's the second book I've read recently that included a Book of Lists--this one in a composition notebook whose cover looked like TV static. Drew's father had written down lists of some of his favorite and least favorite things as well as some of his triumphs and greatest regrets. I'm a sucker for those kinds of lists. This was a sweet little book. Much different than I've been used to reading (no zombies, vampires, demons or suicides). Perfect for a girl that's transitioning into teen fiction. Its about growing up and learning who you really are. Finding out who you really want to be. The main character, Drew, is an outsider. Never really fitting in wherever she is. Then she meets Emmett and everything changes. She sees the world around her a little differently. She learns that she can help shape the world. Th This was a sweet little book. Much different than I've been used to reading (no zombies, vampires, demons or suicides). Perfect for a girl that's transitioning into teen fiction. Its about growing up and learning who you really are. Finding out who you really want to be. The main character, Drew, is an outsider. Never really fitting in wherever she is. Then she meets Emmett and everything changes. She sees the world around her a little differently. She learns that she can help shape the world. The summer of her 13th year, Drew is working in her mother's cheese shop and teetering on the edge of awkward adolescence. She has a crush on the college student who also works for her mom, she misses her father (who died when she was a baby) and her best friend is her pet rat. Then one night she meets a boy about her own age who is living on the streets and everything changes. This is another one of my favorite YA authors, and this book didn't disappoint. I thought that this book was very interesting it teaches people that even when your cautious you can still have fun! It shows a lot of life lessons and responsibilities. Drew the main character is a loner at the beginning but towards the end she breaks out of her shell and makes some friends.it is truly a great story I would read it again in a heartbeat! The book "The summer i learned to fly" by Dana Reinhardt was a cute romantic book, but it wasn't my style. The book is vaguely about a girl named "Drew" who ran away to San Francisco with a boy named "Emmett" because her mother was dating somebody Drew did not like. Overall, i thought the book was okay but i do not understand the meaning of the title. The Summer I Learnt to Fly is ageless. I believe that I'd have loved this book if I had read it when I was a child or an elder. This story is beautiful and it took me back in time to my childhood. So sweet but too short... I guess I decide my own end for it. Beautiful coming-of-age story. Safe for tweens and a solid read for teens, as well. I would recommend this book for girls of all ages, 10 or 12 to adult. This is the best teen book I've read in quite a while. A bittersweet look at those tough early teen years when you are finding yourself and experiencing what just might be first love. Excellent coming-of-age story about Drew, a 13 year old girl, who is waiting for something remarkable to happen and Emmett, a mysterious boy who believes in miracles.